==What does this solar charge controller do? an very Intelligent unit for solar panel! ==How could i use it? ==How do i install it? ✹Classic blue models, compared with the upgrade models more durable (classic is eternal)[You deserve it]This solar controller can automatically manage the working of solar panel and battery in solar system. 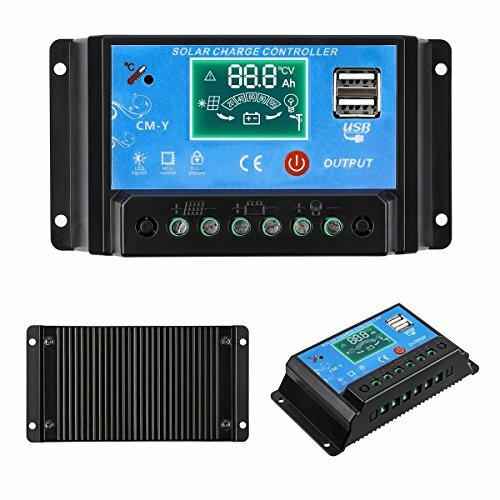 It is easy to set up and operate compare with other solar controller,For protecting the lifespan of your battery, once the voltage of the battery drop below 8V, the solar controller will turn off automatically (LCD will be unavailable at the same time). ✹The solar controller is suitable for 12V / 24V. When installing for the first time, make sure the battery voltage is sufficient for the controller to recognize the normal battery type.The solar controller can only use the photovoltaic panel as the charging source. Do not use direct current or other power sources as the charging source. ✹Caution:Solar controller should connect the battery first,and then connect the solar panel,and finally the load!The disassembly sequence is contrary to the wiring order ! Install the controller on the battery as close as possible to avoid voltage drops caused by excessively long wires, affecting normal voltage judgment. ✹This solar controller is only suitable for various lead-acid batteries. Do not use other batteries (including lithium batteries, nickel metal hydride batteries, etc.). Solar controllers are built-in electronic fused that do not require replacements.Overloading & Short-circuit protection, Reverse discharging & reverse-polarity protection.Easy to set up and operate. Suitable for home, industrial, commercial etc. ✹The solar controller has a low failure rate and will last a long time and protected with moisture-tight coating, minimizing damage from humidity and from nesting insects.The solar controller will heat up while it is running. Carefully install the controller in a flat, well ventilated area. If you have any questions about this product by MOHOO, contact us by completing and submitting the form below. If you are looking for a specif part number, please include it with your message.